Cooking crabs may seem like a daunting task but its the cleaning and size of the crabs which actually gets me anxious. 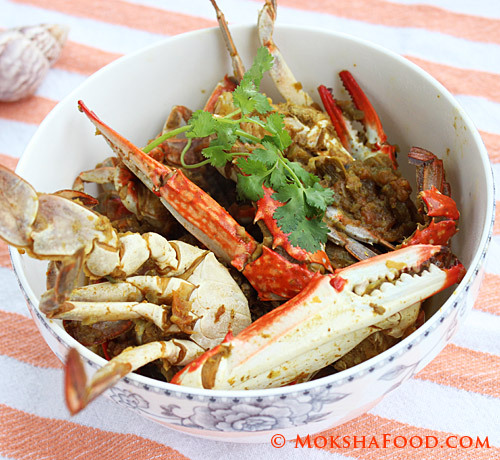 I have earlier made Goan Crab Curry with large BC crabs but this time wanted to try an easier alternative. I found these small swimmer crabs all cleaned and ready in my local Asian store. 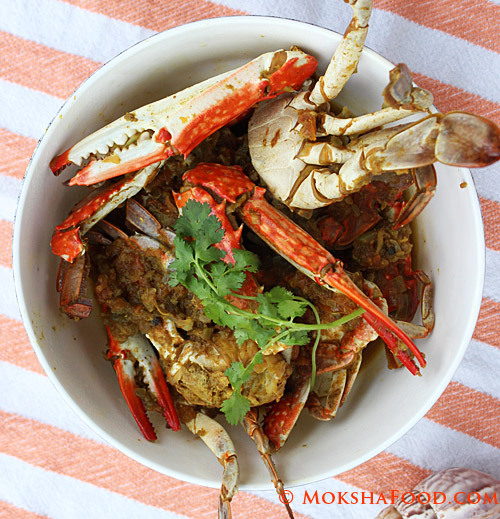 I made a simple North Indian Style Crab Curry which was very flavorful and easy. The crabs were very tasty too and had a decent amount of flesh considering their size. Eating crabs is a very engaging experience as it requires a fair amount of work to actually open the crab and enjoy the meat. Some people would prefer the easy way out by getting canned meat or crab cakes. For me, the act of working hard to eat my meal is very surreal. Its times like these when we use all our senses and enjoy the food to its fullest potential. In a large saucepan, heat the oil to medium. Add the whole spices - cinnamon, cardamom, cloves and peppercorns. Saute till fragrant. Stir in the onions and saute till brown. Add in the ginger and garlic and saute for a min or two. Add all the dry spice powders and keep stirring; take care not to burn them. Stir in the tomatoes and cook till they pulp. Now put it the crab pieces and salt and coat in the masala. Add enough water to create gravy. Cover the lid and cook till the crabs are done about 6-8 minutes. 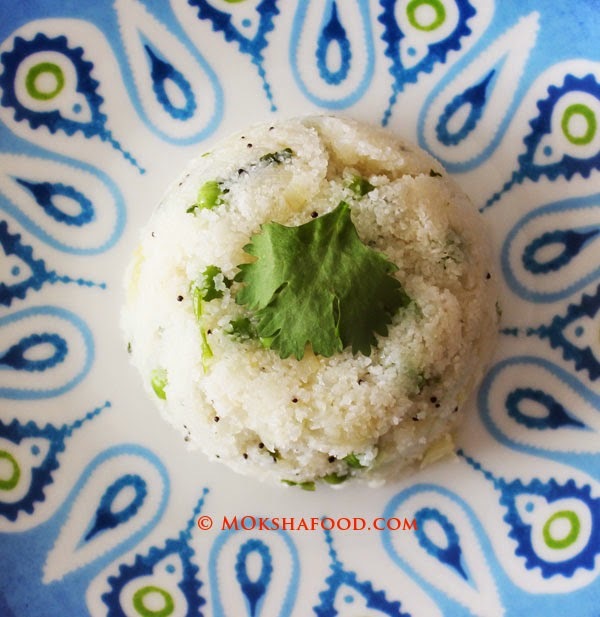 Garnish with cilantro and serve hot with white rice. 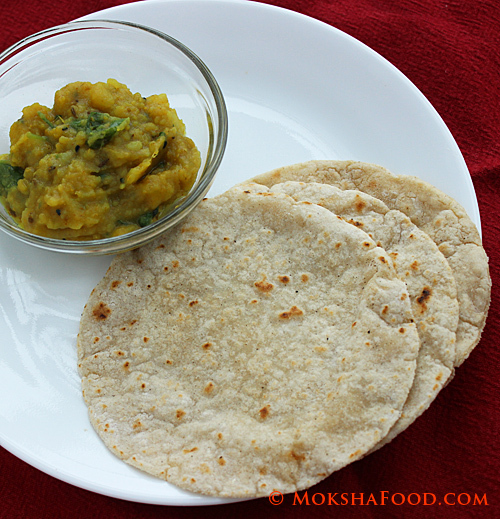 Sweet, Spicy, Nutty Kale Pumpkin Curry! Goat Meat Rice Noodle Soup : Fusion Recipe! 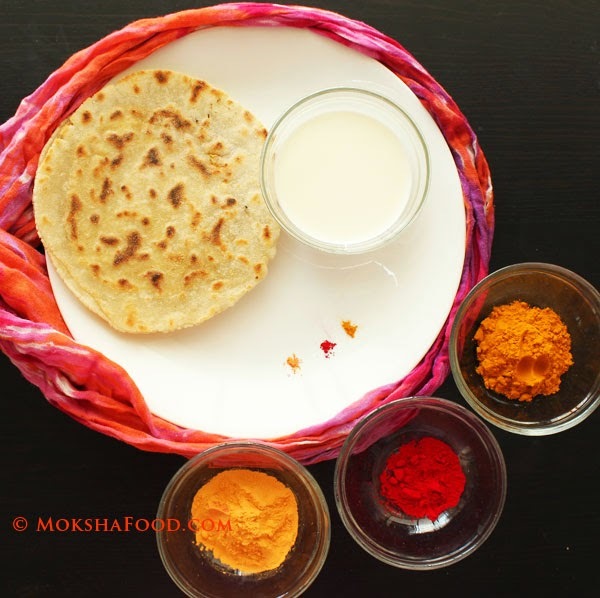 Easy and healthy Kolhapuri Mutton Curry! Sri Lankan Red Snapper Curry!